This picture of the nearby galaxy NGC 6744 was taken with the Wide Field Imager on the MPG/ESO 2.2-metre telescope at La Silla. This stunning space wallpaper of the nearby galaxy NGC 6744 was taken with the Wide Field Imager on the MPG/ESO 2.2-metre telescope at La Silla. 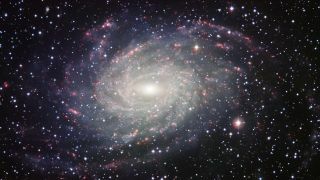 The large spiral galaxy is similar to the Milky Way, making this image look like a picture postcard of our own galaxy sent from extragalactic space. The picture was created from exposures taken through four different filters that passed blue, yellow-green, red light, and the glow coming from hydrogen gas. These are shown in this picture as blue, green, orange and red, respectively.